Most patch management solutions require too much time and too many resources to maintain machines - preventing organizations from meeting their service level agreements and regulatory compliance requirements. Patch deployment can consume a significant amount of network bandwidth, sometimes up to 90% of the pipe — essentially shutting out access to critical business applications. And users are often forced to accept an update at the moment it is received—often with a mandatory reboot—causing even more disruption to productivity. When it comes to reporting, most products show where patches are needed and where they have been sent, but not whether the patch has been “taken” by the machine. Worse, the reporting doesn't show why a needed fix failed to execute. Many solutions also don't allow administrators to deploy a patch or update when a computer is off the network—a situation that is increasingly common as more and more users work remotely. BigFix Patch Management overcomes these obstacles through its high performance, distributed intelligence architecture, broad platform coverage, and bandwidth throttling capabilities. With BigFix, a single server can meet all of your patch management needs—faster, more successfully, and more cost-effectively than any other solution. What is BigFix Patch Management? BigFix Patch Management is a comprehensive solution for delivering Microsoft, Unix, Linux, and Mac patches through a single console. 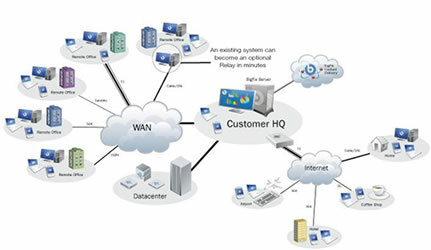 It supports over 250,000 endpoints - regardless of their location or connection type or status. And with a single management server and bandwidth and delivery controls, BigFix Patch Management offers the lowest total cost of ownership in the industry. First-pass success rates and integration with BigFix's asset discovery, configuration management, endpoint protection, and systems management capabilities make it the most comprehensive solution. What is BigFix's Unified Management Platform? Purpose-built for today's distributed enterprise, BigFix's Unified Management Platform provides real-time visibility and control through a single infrastructure, single agent, and unified console for systems lifecycle management, endpoint protection, and security configuration and vulnerability management. The BigFix platform is designed to continuously discover, assess, remediate, and enforce the health and security of servers, desktops, and roaming laptops in real-time via a single, policy-driven agent and single console. BigFix's patented technology distributes computing power to the devices themselves, using the intelligent BigFix Agent to provide a level of visibility and control not possible in legacy solutions. This level of innovation translates into significant advantages in speed, flexibility, and scalability, while reducing the infrastructure and training costs associated with traditional systems and security management. The BigFix Agent is the brain of the BigFix platform. Continuously assessing the endpoint and enforcing policy regardless of connectivity, this single, multi-purpose agent represents a radical departure from legacy client-server architectures by powering a resilient distributed intelligence infrastructure. The BigFix Server stores the real-time view of the configuration and posture of all BigFix Agents. It acts as the single point of contact to the Internet, monitoring and gathering policy content streams and distributing them to BigFix Agents. 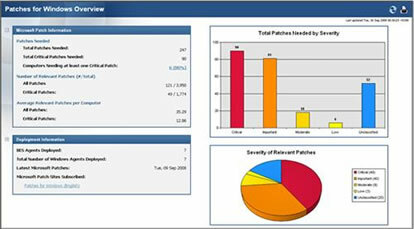 The BigFix Console is the command center from which information on the state of all network computers can be viewed and policies can be defined in real time. BigFix Policies, also known as Fixlet Messages®, communicate policy information between BigFix Agents and BigFix Server environments. BigFix Policy Messages can contain logical criteria to trigger specific actions—for example, “if vulnerability X exists on this client, update software module Y with the appropriate package.” Customers can use BigFix-provided policies or customize their own. BigFix Relays provide distributed points of communication, aggregation and staging for BigFix Policy Messages and patch/remediation content. They help reduce network bandwidth requirements and provide added fault-tolerance to BigFix-based management systems. BigFix Relays can be installed on existing hardware, including desktops and multi-purpose systems such as file or print servers. No dedicated hardware is required, and deployment takes minutes rather than months without disruptive network configuration changes.